Remember back when we made Maple Spice Pumpkin Butter? At that very moment, the equivalent of My Birthday and Christmas having a baby happened: My favorite vegan chocolate chips were sent to me via mail. Talk about a good mail day! Before I start professing my love for these chocolate chips, I want to talk to you about sugar. I am vegan for the animals so naturally, I want to make the world better for animals by helping others make more plant-based choices. Aside from urging you to consume vegan sugar (rather than regular sugar that is filtered through bone char) and consider doing so in moderation, I make no other suggestions to you regarding your intake. I also prefer not to make any suggestions involving other types of food, like oil, salt, or gluten-containing foods and I make no claims as to other types of diets, such as raw or macrobiotic, being ‘better for you.” My reasoning is this: For someone considering a vegan diet, I think the thought of eliminating animal products from one’s diet can be daunting enough. I don’t want to villainize any other foods or ways of cooking because that can make the idea of a vegan diet just that much more overwhelming. There’s no need to make the transition any more complicated than it needs to be. With that said, I personally feel better when I don’t consume sugar, though I’m not super die-hard strict about it. I try not to buy things containing sugar or evaporated cane syrup, though I do use sweeteners (sparingly) such as coconut sugar, brown rice syrup, maple syrup, and (even more sparingly) agave syrup. I do use stevia and xylitol from time to time as well. It’s not something vegans need to do, but I feel my best when I avoid sugar. Because I try to live this way, finding vegan chocolate chips (because this girl needs her chocolate!!!) that were also sugar-free became my unicorn. I’d never seen them yet I wanted to believe that they existed. Which brings me back to our pumpkin butter conundrum. 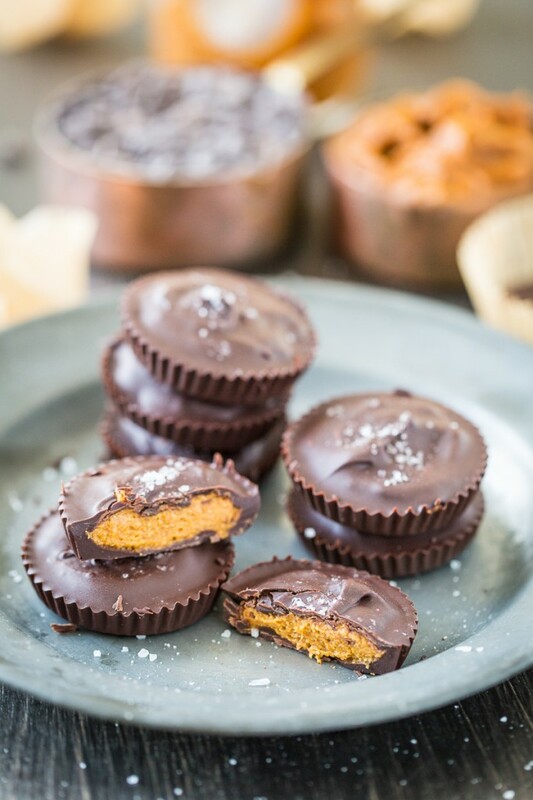 I was going to make just plain old chocolate peanut butter cups (you can never go wrong with a classic), but with that jar of pumpkin butter staring me in the face, I knew what I had to do. 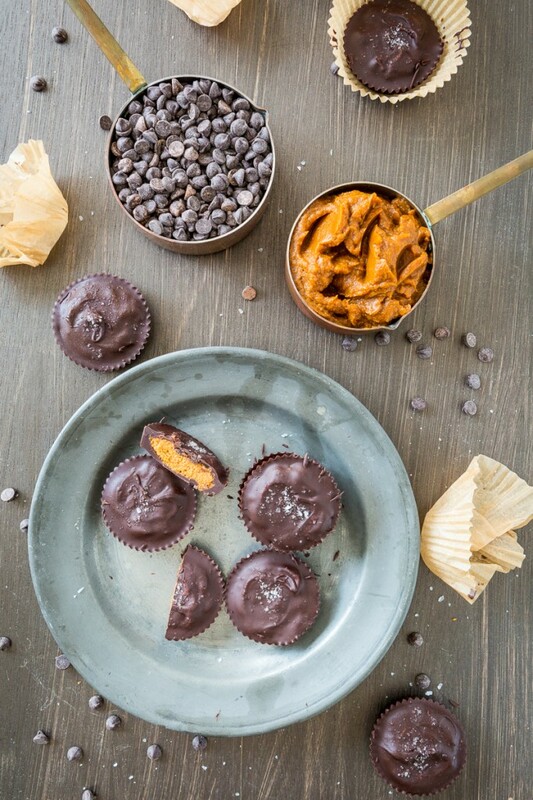 For all of you with nut allergies, these Chocolate Pumpkin Butter Cups are nut-free! 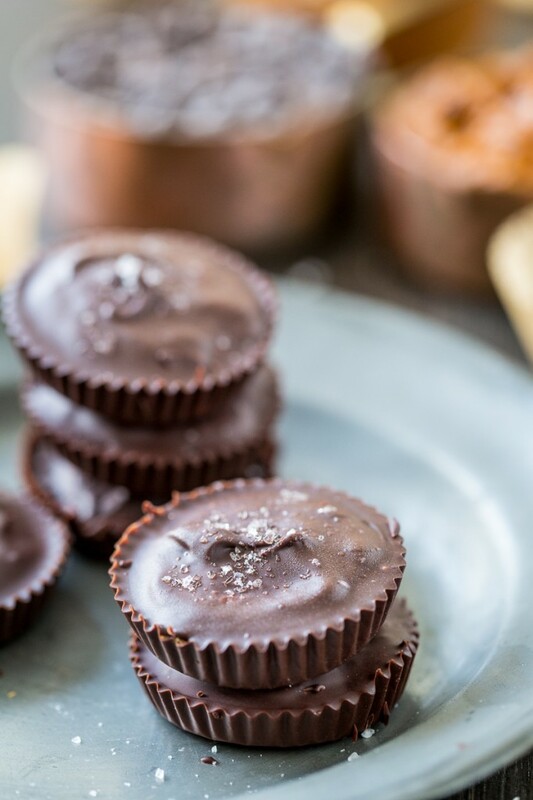 These beautiful little sugar-free chocolate cups are filled simply with pumpkin butter, thickened with oat flour and powdered xylitol (though powdered sugar would work just as well), and sprinkled with a little sea salt. Chris was so ecstatic about them, he actually said that they were “F*%$ing better than peanut butter cups.” Then there was an awkward silence that occurs after someone says something really blasphemous or farts. After a few moments, I said “I don’t know that they’re better,” and then I whispered so that the jar of peanut butter in the cupboard couldn’t hear “but they’re just as good.” And then I ate 3 more. Pumpkin Butter Boredom*** be gone! In a small bowl, mix together the pumpkin butter, oat flour, and powdered xylitol (or sugar). Once combined, place the bowl in the refrigerator. Combine the chocolate chips and coconut oil in a double boiler (or a glass bowl situated over a pot of boiling water), stirring occasionally until fully melted and smooth. Remove from the heat. Line 10 wells of a muffin tin with cupcake liners (or use a plastic candy mold, if you have one). Scoop about 2 teaspoons of melted chocolate into each liner and lightly spread so that it coats the bottom. Take the pumpkin butter out of the refrigerator and scoop 1 tablespoon of pumpkin butter into each well and use your fingers to gently press down and flatten (it will be sticky so just do the best you can). 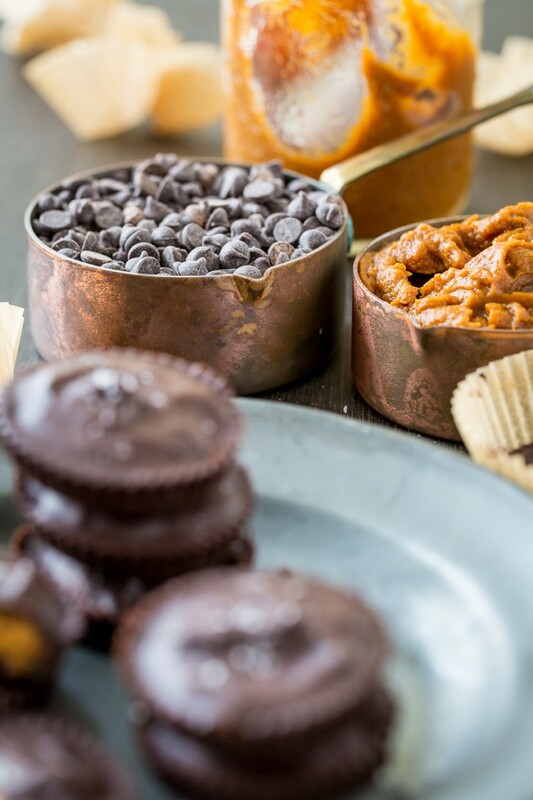 Scoop 1 1/2 teaspoons of chocolate into each liner over the pumpkin butter and use the back of the measuring spoon to spread it out, fully covering the pumpkin butter. Sprinkle sea salt over each one and place the muffin tin in the refrigerator. Let them chill for at least 30 minutes (if you can't control yourself), but preferably for about an hour or two. Once they are firm, they are ready to be eaten. Enjoy! Now for the giveaway! Lily’s Sweets is being super generous and letting me give away 2 bags of their vegan, sugar-free chocolate chips to 1 of my lucky readers! The giveaway will run until 11:59 pm PST on November 19th, 2014 and is open to US residents only. Please use the box below to enter! UPDATE: Giveaway Ended. What is your absolute, most favorite way to use chocolate chips? **Totally not a thing. I just made it up. ***Again- there’s no such thing. Disclaimer: I was given this product to review but the thoughts and opinions expressed here are my own. 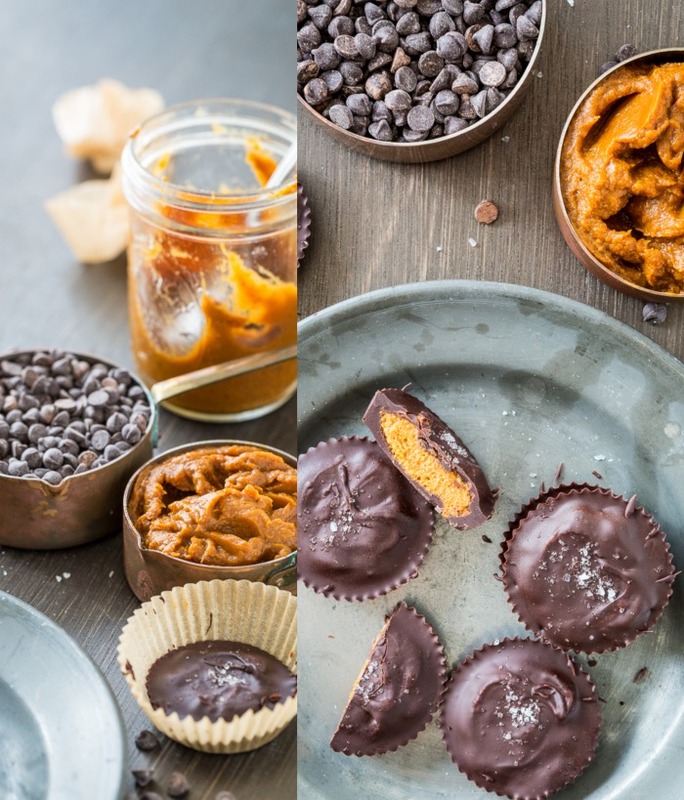 73 Responses to "Nut-Free Chocolate Pumpkin Butter Cups + A GIVEAWAY!" Oh goodness, noooo you didn’t! I have to go with any kind of chocolate chip cookie for my favorite way to use chocolate chips but in cakes, pancakes and muffins they aren’t too bad either!! Pretty much everywhere, especially in brownies and cookies. Sometimes I just grab a couple and let them melt in my mouth to get an afternoon chocolate fix. Definitely in chocolate chip cookies! you make me laugh. this post is awesome. i love you. Stevia and I aren’t buddies. It always gives me a wicked headache but I think I will be making this recipe since your tester responded to it with vulgarity in the best way. I just love that. Chocolate chips will always be my favorite in cookies, but I’ve been known to eat a handful out of the bag at times too. I love using chocolate chips in my chocolate chip pumpkin muffin recipe but the best way to eat chocolate chips is a big handful! 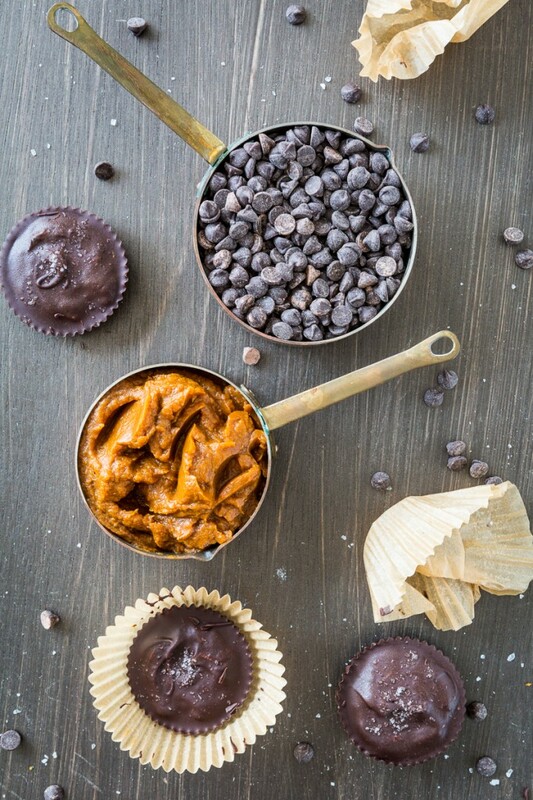 Adding them to cookies, brownies and making delicious peanut butter balls or peanut butter cups…and those pumpkin butter cups look good too. I love Lily’s chocolate chips. My favorite way to eat chocolate is in fudge form. Sadly I eat them straight out of the bag as dessert! My favorite way to use chocolate chips is in trail mix. I love to put them in my chocolate oatmeal. Am I allowed to say that my most favorite way to use chocolate chips is to eat them directly from the bag? If not, then definitely my most favorite way to use them is in very large quantities in dense, moist, and fudgy vegan brownies. Not to try to encourage you to consume more sugar, but I always thought that sugar affected the way I felt in a negative way, too, until I figured out that it’s actually combining sugar and fat in decent (or greater) quantities that does it. So eating lots of cookies, cakes, etc. makes me feel like crap, but consuming a ton of fruit, or adding a hefty dose of sugar to something lower-fat, doesn’t have any (fruit) or much (sugary low-fat treats) effect. That said, sugar’s still something we’re better off limiting or avoiding! I think sugar and refined grains get a bad rap, though, and that some of it is undeserved: I don’t personally believe they’re responsible for our health problems, although in the context of animal product-heavy diets they certainly don’t help. The real issue with them is that they displace healthier whole plant foods from the diet. Eating a diet centered on anything but whole plant foods doesn’t add up to longterm good health. Chocolate chip cookies are my fav, but I am definitely trying these cups! My WF doesn’t have Lily’s, though. I like chocolate chips every which way — but I think my favorite thing to do is just eat them out of the bag! Thanks for the giveaway opportunity! I love chocolate chips in so many ways, but my favorite way is probably in vegan cowboy cookies! Double Chocolate – Tart Cherry Cookies! Lately I’ve been using melted chocolate chips to make a tofu based cupcake frosting. Delicious! Warm gooey chocolate chip pancakes are my weakness. just eat them! in a recipe it would oatmeal cookies. Peppermint bark! I mix white and bittersweet. I love using them in a trail mix. Thanks for the giveaway! 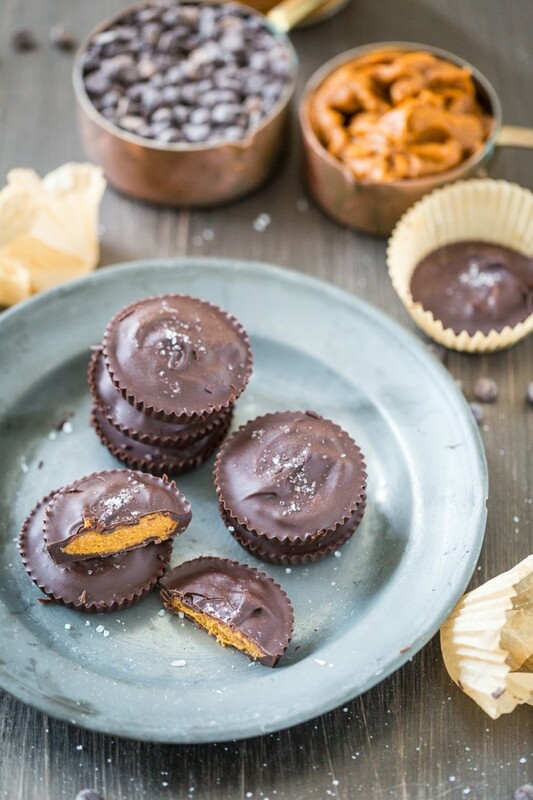 Love these chocolate and pumpkin butter cups! Definitely can see myself snacking on many of these.. definitely a recipe I need to try! Love the pumpkin – perfect for fall! Aw man, I wish this contest was open worldwide! 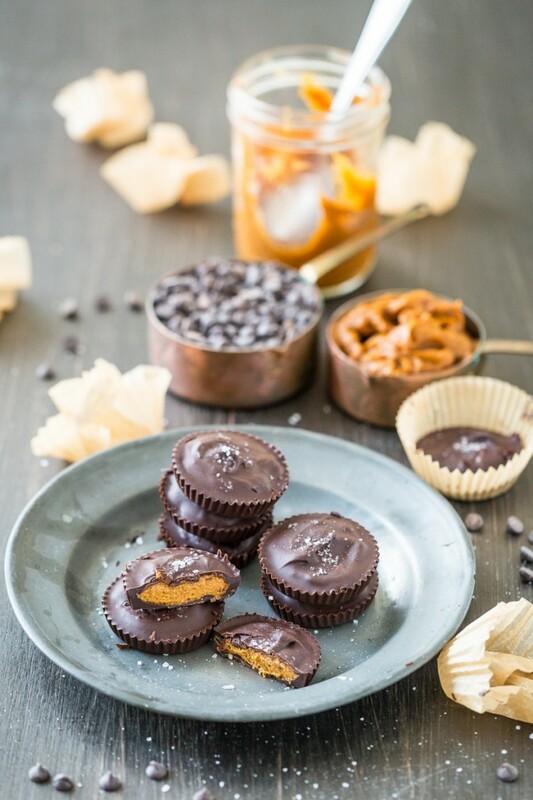 Those pumpkin butter cups look to die for! Totally going to make some for Christmas this year, I’m sure the family will love them! These look amazing! My favorite way to use chocolate chips is in brownies. In a good ol’ chocolate chip cookie!! I love putting chocolate chips in my oatmeal and protein shakes! Truly and honestly, my favorite way to eat chocolate chips is right out of the bag. I love them in chocolate chip cookies and/or banana bread! Saw these on FG and just had to come say WOW! How gorgeous. Glad I stumbled upon your site. Loving every bit! So I’m not ashamed to eat chocolate chips right out of the bag…but I also love them in chocolate chip muffins with fresh cranberries! Soooo yummy! Wow, those sound amazing! 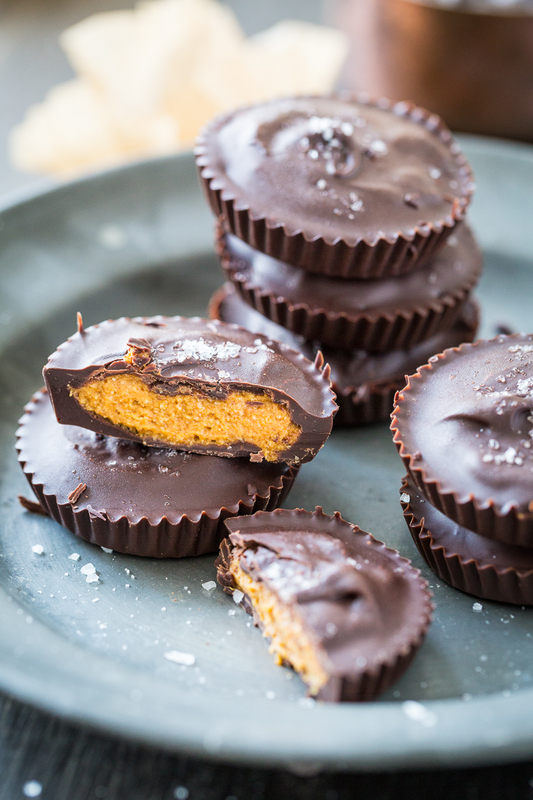 I thought peanut butter cups were the best thing ever until I saw this! Besides eating them straight out of the bag? Probably cookies. I just love eating them out of the bag….but I guess if I had to pick I love them in pancakes, cookies, and oatmeal! Chocolate chip cookies! 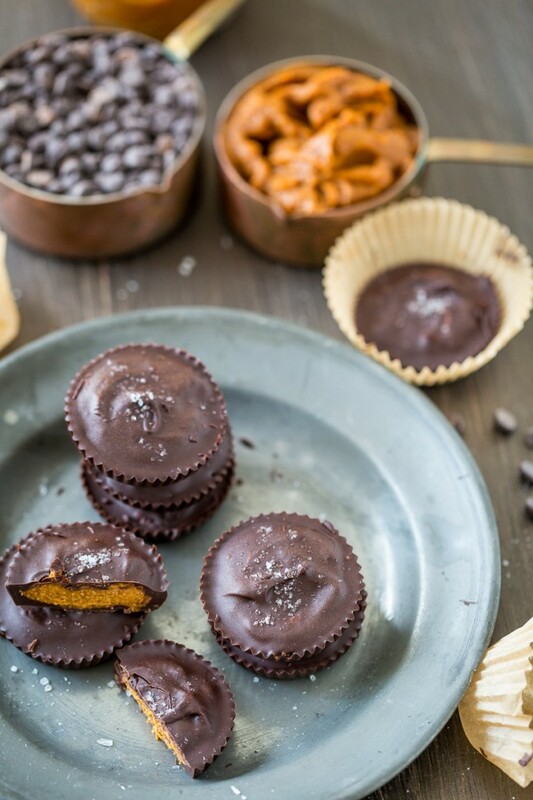 Can’t wait to try it in something more exciting like these Chocolate Pumpkin Butter Cups!! My favorite way to use chocolate chips is in cookies, cupcakes and trail mix! I keep saying that I need to make some of those chocolate cup things. This may well be where I start! And seriously, you got bored of pumpkin? By the handful is best. If there are any left I might make chocolate chip cookies. Chocolate Chip Peanut Butter Blondies! I used to love chocolate chip cookie dough, but I avoid it because of the eggs and all the sugar. It would be awesome to win and be able to make some vegan, low-sugar cookie dough! 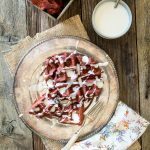 Your recipe sounds so delicious, and the pictures are beautiful! It’s got to be cookies!! pumpkin choc chip muffins are my favorite so I must make these asap! My favorite way to use chocolate chips is in warm, freshly baked chocolate chip cookies! My favorite way to eat chocolate chips is probably in cookie dough. Baking is so unnecessary sometimes. Though we are not used to muffins, I’m really impressed with it. I would like to add them in my granola bars.